Music merch is not a new concept. For years, artists have made branded souvenirs available to those who attend their gigs. But as we’ve mentioned before, music merchandise has recently evolved into a high-profile business, thanks mainly to pioneers like Kanye West and Beyonce. The souvenirs that were once random tchotchkes hoarded on a shelf or in a drawer have evolved into coveted products. These days, artists focus their attention on creating merchandise that fits into into their larger brand story. 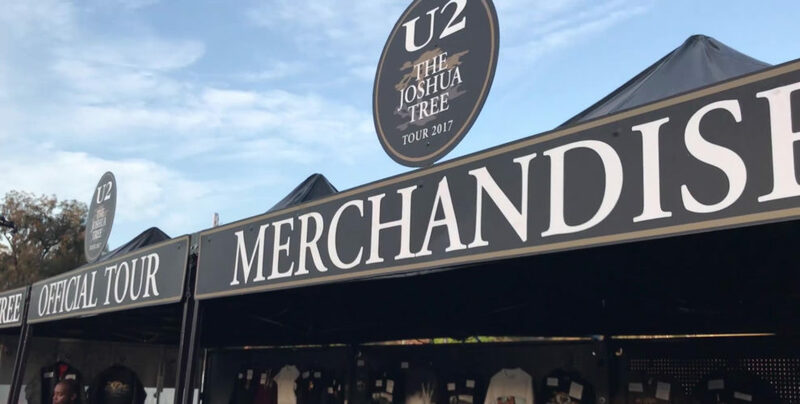 For some musicians, merch sales even make up a majority of their income, so it’s important to artists that the quality of the merchandise is in line with their brand. Beyond carefully considered designs, artists, such as Taylor Swift, Beyoncé, Flume, G-Easy and U2, are also recognizing the value in offering quality T-shirts that people want to wear again and again… and that means they are turning to BELLA+CANVAS! We recently chatted with Rich Santo, CEO of Culture Studio, one of the largest tour merch printers in the country, to find out more about the importance of merchandise for artists. Check out our Q&A below! Q: How important are merchandise sales as a revenue source for an artist? A: Artist merchandise sales are not only a great source of revenue, but it is also the highest form of expression. With amazing merchandise, an artist can further establish their brand and win loyal fans. Q: Have you seen a shift in the music merch industry’s purchase behavior from price-driven to quality-driven? A: We have seen a shift to both quality garments and a demand for amazing prints. The clients themselves are really pushing that movement, since they are the ones demanding quality from their favorite musician. Q: What do you look for when selecting a blank garment for an artist or tour? A: We look first to the style of the artist. Not everyone is looking for the same thing, so we try to engulf ourselves into the band and understand their vision. Q: What are the most popular music merch trends and styles you see requested from artists? A: The go-to merch today seem to be blended garments, such as the BELLA+CANVAS Black Heather. They are certainly in demand when paired with a distressed print. Q: What are some artists you’ve used BELLA+CANVAS tees for? A: We just recently did some amazing design on BELLA+CANVAS for a concert that was inside the Indy 500 called Snake Pit. Everyone loved the garments and our client sold out completely of the apparel! Now that we know what artists our looking for, we wanted to find out what fans really think of their BELLA+CANVAS tees. So we asked them firsthand during U2’s epic Joshua Tree Tour at the Rose Bowl in Pasadena, Calif. in May. Get the scoop in our video below or on our recently launched YouTube channel. For more inside content like this, be sure to subscribe to our YouTube channel!